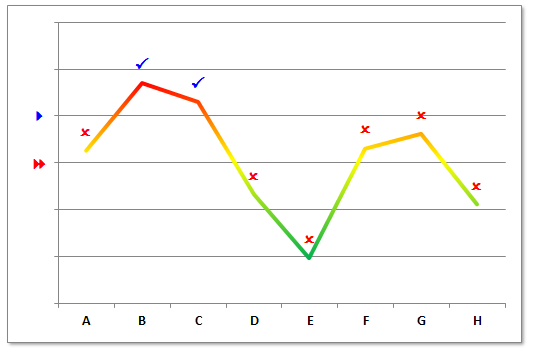 Custom Chart Axis Formating – Part 2. Last week I introduced the technique of using custom Number Formats for Chart Axis Labels which was well received. In the original post I mentioned briefly that this technique can be applied to Data Labels, but didn’t demonstrate it. SO HOW DO THESE WORK? As with cells you can apply custom Number formats to any of the Charts numerical objects including the Charts Axis and Data Point Labels. 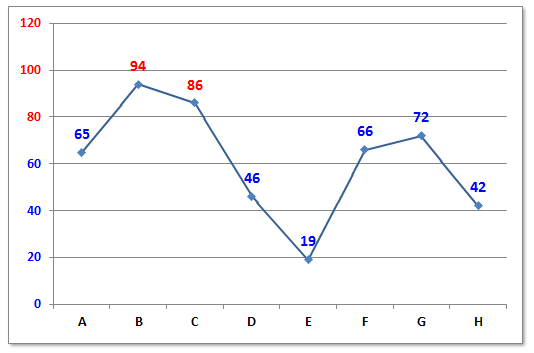 Select the Chart and then the Axis or Data Point Labels. The links below will explain the intricacies of Custom Number Formats. Version – Excel 1997/03, Excel 2007/10. WHAT ARE YOUR FAVOURITE CUSTOM NUMBER FORMATS? I recently learned what I thought was a really simple but useful number format. A custom format followed by ;;; will not display 0 values. Example format #,##0.00,,;;; will display 12,570,000 as 12.57 and display 0 as blank. I found that this really helped me reduce some of the clutter on dynamic charts. Thanks for another good article. Once I have created a custom format, how do I remove/delete it from the list again? I tried a few methods such as right click (no option to remove). I tried hi-lighting the custom format and hit the delete key. Nothing works. Unlike the Custom Number format dialog for cells they don't have a Delete Button on the Chart Number Formats dialog, Maybe next version? If you don't want to use your Custom Format select one of the built in formats. great tips on the formatting. 1 curious answer: Is it possible to highlight Sat/Sun for DATES on x-axis? assuming i have 1 month of daily product sales, x-axis = dates, y-axies = sum of sales. I would like to know a way to apply custom formatting to the horizontal axis. How do I get the number formats to work on a Dynamic Chart.i.e: Chart with different scaling based on different data sources. For example, if I have five KPI and each have a Target, how do I get the chart to dynamically change number format based on the data selected? @Hui: Thanx for the speedy comment, I've checked the link and your last comment is almost what I need but I can't get it right for my application. See below my problems. Data below is displayed on the dynamic graph. The Graph only shows two data lines Target and the actual KPI data. on the data line I won't to highlight the numbers based on the info below relative to the Target line. I remember seeing a blog post some time ago about the number format colors. The default green color is ugly, and there was some neat trick to change that into more dark green version. I think it had to do with assigning some code instead of [green]. @Hui: I just forward you a mail now. I've also noticed that the custom only allows two conditions and I struggling to put more custom for same chart. As indicated, the graph has different target format i.e 1% and 95%. I have %'s, monthly sales amounts (all > $50000) and invoice counts. However I didn't apply this formatting to the axis number format - it will always have 0 as 0.00% - any ideas how to avoid this? @Oleksiy: Follow link on Hui comment (11). Looks like it might address your problem. Problem is that I can't apply this to the axis format as it always has zero. Hello Hui, Please suggest how can I highlight ( making it bold or colored) a particular month among 12 months that I put in X axis. You can use the same technique with Dates that are Dates, but not when they are Text. Thanks a lot Hui for your great suggestion. So it is only possible for months not for any other texts! Which are all numbers anyway. If you need to do text, you can consider using Text Boxes or cells behind the chart where you can apply conditional formats to. This is great and very timely because I suddenly have a need for lables that change format according to the values - so thank you. A quick question however, on a slightly different issue. Is it possible to format the markers so they don't show for a zero value but do show for any value above or below zero. Thanks for the quick response. However, I don't seem to know where to type the format. I can see how to do this for the Labels but not for the actual graph marker itself. Esentially I want the marker to show if there is a value, but not if it is 0. Thank you so much that worked well. I had a couple of problems at first because I had the graph type set as a line and the #NA had no effect. However, once I changed it to XY scatter, your suggestion worked like a treat! I have a data validation cell (A1) with a dropdown list for "Qty" and "$$$". My data set is values that I plot asa Pie Chart (In Column B1). These values are conditionally read from 2 different tables depending on the drop down list selection for $$$$ or Qty. I have conditionlly formatted all cells in B1 to display number format as Number (0 decimal places) or Currency $ again dependent on selection made in A1. Now my pie chart is updating correctly based on my selections and data but the labels do not get formatted to Number or Currency automatically. How can I conditionally format the labels based on selection in A1? You can't conditionally format chart objects against another cell only against there own values. I'm trying to customize the x-axis from 0,1,2,3,4,5 to read: 0, KG, 1, 2, 3, 4, 5. How can I do this? Also, the x-axis figures are currently on top of my chart, how can I move these to be on the bottom? Thank you for your help with this! To clarify, I'm trying to get the x-axis to read: 0 KG 1 2 3 4 5 (evenly spaced). The problem may be in trying to put "KG" in the "1" place, "1" in the "2" place, and so on. What type of Chart is this ? 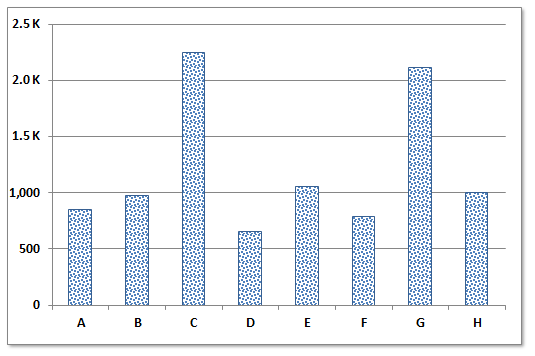 It's a clustered bar chart that I'm using to show when curriculum was developed for different subjects. The y-axis indicates the year the curriculum was developed and the x-axis corresponds to the grade level (KG is short for kindergarten, followed by Class 1, 2, 3, 4 and 5). Once properly located and sized, The Text Box could be grouped with the chart so that they remain fixed to each other. I think this might work for you...basically what Hui said but a couple small tweaks. It will make negatives appear as 0 and 0 appear as KG, positive numbers will remain as they are. Then select the x-axis and ctrl+1 to go to format axis. In your data, make sure that all data points relating to KG are 0. Your clustered bar chart should have 0 KG 1 2 3 4 5 for the x-axis labels. This worked perfectly. I really appreciate all of your help. minor note on the customer format I posted...it doesn't need the [<0] in General;[<0]"0";"KG". You can just use General;"0";"KG"
this site is very good for me. this site has very good information from excel. From what i've been told i can not express all of that as a chart label number format, so i was looking at other options. Within VBA and Excel, how can i apply a NumberFormat like this to a chart? Actually the numbers ghot screwed up when i pasted. If it is just "k"s that you want to add, then using the format #,"k" should work. For ex instead of 0.1 i want p90 and instead of 0.2 i want p80 all the waiy to p0. Is this possible? How can I use an image instead of a text on chart axes? I would like to use companies logos instead of using the names on x-axis. Is it possible? Set the Custom Number format to "";"";""
Is it not possible to insert the picture automatically, just associating each label with a picture? (pls, see the third image). I though the images had been inserted directly from cells through a formule. I have data labels in percentage format. which custom format i should use to have green color fornt if more then 100% and red color font if less then 100%. I'm hoping you can help. I have a dynamic chart for financial data. Most of the charts have a y axis based on $ with a couple charts that are a %. I can not use a option mentioned above since some of the $s have a negative value. I tried conditional formatting the source, but the 'Link to source' does not pick up the conditional formatting. Is there a way to have the y axis dynamically change from $ to %. I am using a combo box to change the data on the chart. Can you post or email me a sample file ? I emailed the file. Did you receive it? I need this question to be answered for me too. My "linked" data is conditional formatted to be red given some criteria. I want my axis to be red too, but it only picks up the number format, not the conditional formatting. The “linked” data from my table is conditional formatted to be red based off of some criteria. 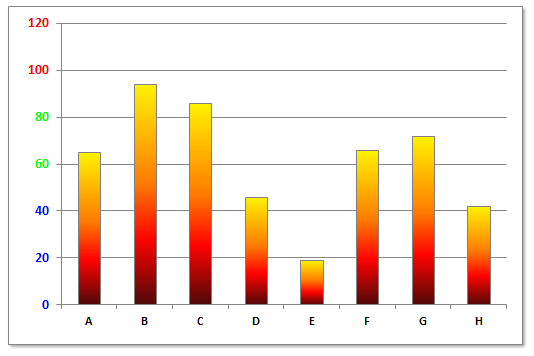 I want my chart axis to be red too, but it only picks up the number format, not the conditional formatting. Is there any way to link conditional formatting of sourced data to axis labels? Your posts are very helpful. Is there a way to conditionally format the data label position/location (in addition color, as you have shown in this post)? I have some line charts with markers showing the same measure from year to year. Each chart has two lines. One of the lines is an average of participants in the group and stays the same. The other line is for each participant and gets updated dynamically to produce about 50 unique charts total. If I put the data labels "above" or "below," they look good for about half the participants, then overlap or are confusing next to each other for the remaining half of the participants (given that the one line is the average of all participants). Right, left, and center do not look good, as they overlap the lines. I tried using the Chart Tools---> Design---> Style 2, which makes the markers bigger and places the data label inside the marker. However, for the 3-4 participants per year who have about average values, the marker for the participant overlaps with that for the average and makes the labels unreadable. Thank you for any help you can offer!